Are you bugged by the brightness of your computer screen in the nights? Or you are one of those who didn't ever notice it? Regardless of those queries, every computer screen probably needs to display warmer colors in the nights as the surrounding environment is darker at that time. Even if you've got your room lights turned on, they are obviously not as bright as the sun. "Ever notice how people texting at night have that eerie blue glow? During the day, computer screens look good—they're designed to look like the sun. But, at 9PM, 10PM, or 3AM, you probably shouldn't be looking at the sun." So, how does F.lux help? It brightens your computer screens to normal for being easily visible in the daylight and switches them to warmer, less bright colors in the nights. "It's even possible that you're staying up too late because of your computer. You could use f.lux because it makes you sleep better, or you could just use it just because it makes your computer look better." If you are living in the US, you can just enter your ZIP Code and if not is US, you'd need to enter your latitude for F.lux to look up sunrise and sunset times for your zone. 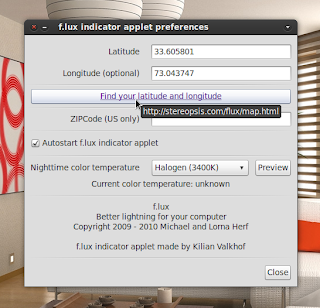 Once installed, 'fluxgui' would appear under Applications > Accessories sub-menu in classic Gnome or if using Unity, you can search the Dash and start it. If you are a US resident, enter your ZIP code at the first screen or look up your latitude by clicking "Find you latitude and longitude" and enter it as shown in the screenshot. You most probably also want to start F.lux automatically when you boot your PC so tick the box for "Autostart f.lux indicator applet". Now you would be able to easily access F.lux from your notification area. "Halogen (3400K)" proved to be the best color profile for me in the nights but you can also try other ones. With some graphics cards, F.lux needs you to re-login for the changes to take effect.